I’m thinking yeah, it probably is. We got a confirmed bad news: our wireless router installed on the camera pole is dead. I do not know how and why it happened but it will take a while before we can fix it due to the holiday season. The earliest possible time for us to return to the camera site is early Jan.
Yan, can you post a message on the web saying that the camera is down for maintainence until Jan. 10? 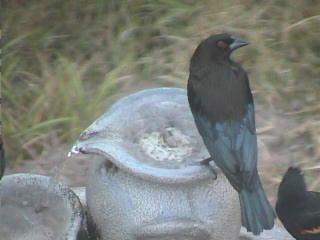 birdcammers.net – rafa’s site with video from CONE Welder and several other birdcams. feedmecam.com/blog/ – a blog for the feedmecam site, a birdcam in Georgia (US). Race Rocks Ecological Reserve – a remote island off the southern tip of Vancouver Island in British Columbia, currently equipped with five different webcams. 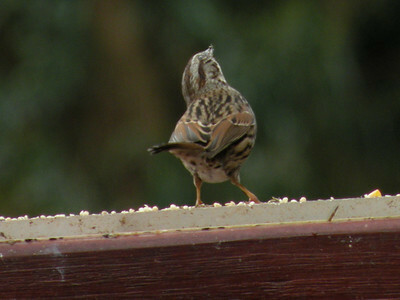 Living the Scientific Life – a blog with a really fun “Mystery Bird of the Day” feature. What a funny posture you caught this bird in! This is an adult Cooper’s Hawk – as you guys noted it has it’s hackles raised so the head looks flat, which Sharpies rarely do. Also, that darker cap on the top of the head, with the distinct line at about eye-level above which it’s darker is typical of Coops – Sharpie’s caps will appear to be all one color. I agree that the darkness under the chin appears odd, but I think most of that is just because we are looking at stills where the bird’s head is turned, so that the gray on the side of the face appears to stretch down to the chin. There’s a few seconds in that top movie, right when the bird turns to face forward and looks up, and you can see that there is streaking under the chin, that it’s not all gray. And in that second photo down, the head is not quite as turned, and when you look closely you can see streaking under the chin. 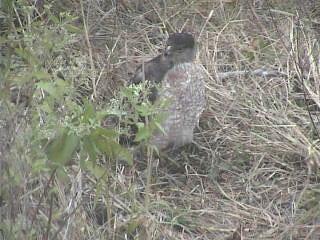 Though I agree there is usually a more distinct line between gray cheek and streaked upper breast! It is probably a combination of the bird being heavily streaked all the way up to the chin, along with the weird posture and resolution of the photo. Accipiters can be very difficult to tell apart! And there is individual variation in the amount of barring and streaking they can have. I get a lot of emails asking for ID help, I’m going to paste in below some of the most reliable field marks I tell people to look for. But working with pictures is often difficult – in this case the head is giving the only clues. Ideally you will be able to use a combination of field marks instead of relying on one or two. Overall, Sharpies are smaller, but since female hawks are larger than males, the male Cooper’s Hawks just barely overlap in size with the female Sharp-shins. There are a few good ways to tell them apart, especially if you have a picture – Cooper’s Hawks tend to have a fiercer-looking face – their eyes are set farther forward, and they often raise their hackles (feathers at the back of their neck), giving them a more square-headed appearance. Sharpies have a smaller, rounder head with the eye more in the middle of the head, giving them a wide-eyed, surprised look. Of course, normally you would not be able to see that in flight very well. 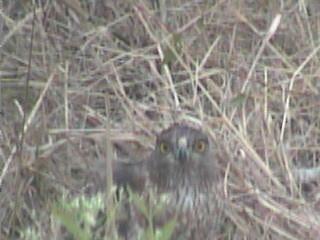 Cooper’s hawks tend to have more stable flight with a straight front edge to their wing (in a soar) and a larger head. Sharp-shinned Hawks tend to flap a bit more, and be a bit more unsteady (especially fighting the wind), and often soar with their wings hunched forward a bit, which makes it difficult to see their smaller head. The tail can be a good clue as well – Sharpie tail feathers are all about the same length, so their tails look square, where the outer tail feathers on a Cooper’s Hawk are shorter than the inner ones, make their tail look rounded at the end (this can be hard to judge depending on how they are holding their tail…). Thanks for the email Kay! Good luck with the webcam. We are working on updating our website (long overdue!) so be sure to check back, we’ll have much more useful ID help on there soon. You may also want to post these links to ID tips for Accipiters – the top two are white papers by Rich Stallcup, a naturalist and research associate with the Point Reyes Bird Observatory. The other two are ID tips from the USGS Patuxent Bird Identification InfoCenter for Sharpies and Coops. I love the look the bird has in that last shot. Did it hear the camera moving? It’s certainly looking right at us. So, what species are we talking about? I feel pretty comfortable that this is either a Sharp-shinned or a Cooper’s, but I’m not very sure beyond that. The head does look relatively large, though, and as idbirds pointed out in chat, it has more of the flat-topped Cooper’s look than the rounded Sharp-shinned appearance. I guess on balance I’d probably favor Cooper’s for the ID. In any event, great camera work from txbird and rafa. Thanks! Update: loughman1 talked to some folks she knows at the Golden Gate Raptor Observatory, who provided a detailed explanation of why this bird is a Cooper’s Hawk. And now folks in the game have ID’d it, so it’s official. Yay! [10:59:25]	txbird:	do you want cam? [11:13:41]	txbird:	where did it go? [11:16:21]	rafa:	did you find it there at the brush pile? [11:18:04]	txbird:	yes. on the ground. [11:18:53]	rafa:	hehe, the rwbl. all gone. [11:19:29]	txbird:	…and all other birds too. [11:24:21]	rafa:	did you id it? [11:25:37]	txbird:	not yet. i want to look in the sibley first. ok, thanks for the clue! [11:27:04]	rafa:	i’m not sure of the id. first time for me too. 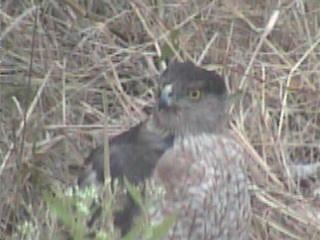 but i’d say genus Accipiter. [11:29:18]	txbird:	when i saw it crouch and saw those eyes, i had to in. that might have been time to zoom out, but it seemed to just disappear. it was so fast i don’t think we could have captured the departure. [11:32:41]	txbird:	it didn’t move on the ground for the complete 20 minutes either. [11:35:15]	rafa:	could ypu please show me the place where it was? [11:36:11]	rafa:	oh, yes. thanks! [11:41:12]	elanus:	oops. my bad. [11:41:32]	rafa:	are you good with Accipiters? [11:41:36]	elanus:	accidentally clicked on the panorama. [11:42:04]	elanus:	I bought that “hawks in flight” book, and it’s been helping me. [11:46:47]	rafa:	txbird, i’d say it ws perched on a branch of the brushpile, not in the ground. [11:48:10]	elanus:	I’d have a really hard time distinguishing between cooper’s and sharp-shinned, based on those photos. [11:49:35]	txbird:	yes, the branch is there. 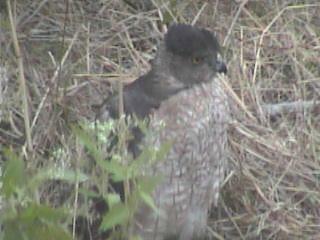 [11:50:25]	elanus:	about all I can see to go on is head size (cooper’s head should be bigger). but the only way I know of measuring that is by looking at how much the head projects forward of the wings in flight. and we don’t have that view to look at here. [11:51:26]	rafa:	my impression is that was small enough to be a Sharp-shinned but we all know how difficult is to see the size there. [11:51:31]	elanus:	I don’t suppose anyone got video? [11:52:04]	rafa:	yes, i got a few. but there isn’t much more. [11:53:07]	elanus:	if you post it to youtube I’ll embed it in the blog item I’m working on. [11:59:35]	txbird:	i had that same thought. [12:00:05]	rafa:	elanus, they are uploading. in a few minutes go to http://www.youtube.com/user/vinebre and choose the one you want. [12:08:33]	rafa:	idbirds, txbird caught it. i went into CONE sithe and there it was when i turned cam on. [12:10:13]	idbirds:	wonderful find, tx!! Please click on the link above for my holiday greeting to CONE Welder users. Hope you enjoy it! You are currently browsing the The Networked Bird Observatory Blog blog archives for December, 2008.